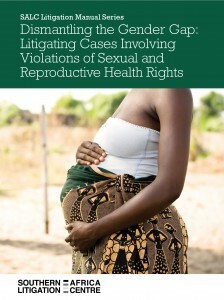 This manual is a resource for private and public lawyers in southern Africa who are litigating cases in domestic courts challenging laws, policies and practices involving sexual and reproductive rights. The manual focuses on two specific sexual and reproductive rights issues: discrimination in accessing sexual and reproductive health services; and failures in obtaining informed consent in the context of sexual and reproductive health services. The manual may also assist civil society organisations seeking to use litigation as part of their advocacy strategy in promoting and protecting the rights of women, particularly women with disabilities and women living with HIV, to access sexual and reproductive health services. Download the SPANISH Translation of the manual here. Lawyers and civil society organisations can contact SALC at enquiries@salc.org.za to request a hard copy of the English Translation of the manual. The Arabic and Spanish versions are only available in soft copy.